Last time we started looking at the t2 frigate line, and this article will continue where that one left off. We've already covered assault ships, which are probably the more rounded of the t2 frigates. Now we're going to start looking at some of the slightly more specialised t2 frigate classes. Interceptors can be split into two classes - combat interceptors (claw, crusader, crow and taranis) which receive bonuses and slot layouts which benefit damage dealing, and fleet or tackle interceptors (stiletto, malediction, raptor and ares) whose bonuses and layouts are geared more towards tackling. While eve doesn't make an explicitly distinction between the two classes, they are typically flown in very different ways and as a result I'll be covering each separately. Combat interceptors are, as the name suggests, built for combat. They lack the staying power of assault frigates, however they make up for it in the one area where the AF as a class is sorely lacking - speed. An afterburning combat interceptor is able to reach speeds on par with most mwding cruisers, and with a mwd itself the combat interceptor is potentially the fastest ship class in eve with the exception of the dramiel (angel cartel faction frigate). This speed allows combat inty pilots to pick their fights and often escape when things go south. Combined with a strong damage output, this makes combat interceptors a very popular choice of ship for solo pvp. In gang, the combat interceptor generally fills one of two roles. Thanks to the mwd sig radius bonus shared with all interceptors, these ships receive far less damage while chasing down targets under mwd. This makes combat interceptors a popular choice for the 'chaser tackle' role I mentioned during our my previous article on assault frigates. They're also commonly found filling an 'anti-support' role, chasing down opposing fleet interceptors and ewar ships and either driving them off, or putting them down. There are two schools of thought when fitting combat interceptors, which will drastically alter the probable outcome of any fight. The first is to fit for speed, fielding an mwd and filling the low slots with speed mods. This kind of fit is quite common among newer inty pilots, and while it is effective in some niche roles it is usually very easy to kill. As I mentioned in my Interceptor Fishing article, a t1 frigate can quite comfortably destroy this kind of fit, providing you can get it into scram range. The second option is to fit them as a brawler, with a solid tank and sometimes an afterburner instead of a mwd. These tend to be considerably harder to kill and are much more dangerous, although they sacrifice some speed in order to achieve that. On paper, the claw is the fastest of the combat interceptors and the second fastest ship in the game behind the dramiel. However, the claw is naturally quite fragile (only the crow has lower base hit points) and due to its 4/2/4 slot layout it is effectively forced into fitting an armour plate at achieve hp on the same level as its counterparts, bringing the claw's top speed down below that of its close rival the crusader. If you see a claw doing 4km/s or more, the chances are it has little to no tank and will die quite easily if you can catch it. Beware of arty claws however, which will attempt to kite you or hold you at range and are more than capable of doing so. With the addition of an armour tank the claw becomes a fairly solid brawler. With three double damage bonused turrets and a valuable tracking bonus the claw puts out respectable dps, although it lacks the cpu to easily fit damage mods. The claw also has the luxury of a spare hi-slot which will typically contain a nosferatu (to support an active rep) or a neut (to turn off your own). What it does lack is a web, although the flexible range of autocannons makes that less of a handicap than it would seem. Against non-interceptors its superior speed may still give it a measure of range control, however most frigates with a web should be able to dictate range against it. The claw doesn't receive any range bonus to its weapons, so as an opponent you're generally better holding one at range rather than going in close. Combat interceptors receive a reduced version of the racial resist bonuses seen on AFs, meaning EM is a poor choice of damage type to use against a claw. Any other will probably work fine, with explosive usually being the best choice by quite a large margin. At a glance, the crusader is very similar to the claw - both have a 4/2/4 slot layout and identical fitting, although the crusader receives 4 single-bonused turrets rather than the claw's 3 double-bonused. This gives the crusader a clear edge in damage, although it also leaves it without the same degree of cap control (a potential problem for an amarr laser boat) and tighter on powergrid after fitting a 4th gun. The crusader handily makes up for this by having both a significantly larger base capacitor (albeight with the same recharge rate) and almost twice the base armour hp of the claw. So where does this leave us? Most of the comments I made about the claw remain true here, with a few minor differences. Firstly, crusaders tend to be more fragile since plates are difficult to fit, with 'sader pilots usually opting for pure resist-based or active tanks instead. While they are marginally slower before fitting, this also makes them a faster ship than the claw in practice. Also, the impressive range of pulses with scorch (combined with the crusader's tracking bonus) means that the crusader can easily apply its full damage anywhere within web range - thus while you may still be able to dictate range against it, it may not help you much! This also makes kiting crusaders quite popular, although they are overshadowed in this role by the slicer (which we'll discuss later). The crusader is very dangerous in short-duration fights due to its high dps output, and it excels at taking down soft targets like tackle interceptors. However, without a nos the crusader has no way of replenishing cap. While it will be cap stable with guns, propulsion and tackle, an active tanked crusader will not be able to run its repper for long. It also has no defence against neuts - once capped out it will generally stay capped out, making it quite vulnerable to cruisers and battlecruisers with medium neuts. The crusader's armour resists are all fairly even, although kinetic and thermal are marginally lower. The taranis is the slowest of the combat interceptors, however it is also the most popular. It fills a sweet-spot between the other combat interceptors and the gankier AFs and faction frigates, and does so exceptionally well. First off, the taranis gets a 4/3/3 slot layout with 3 turrets (a layout shared by the rifter and the ishkur, both of which are also considered among the best in their class). This allows the taranis to fit either a web (popular for solo work) or dual propulsion (popular for gangs), giving it a great deal of versatility. A double damage bonus combined with a tracking bonus, 2 light drones, and the naturally high dps of blasters gives the taranis a damage output far higher than any of the other combat inties (although with far less flexible range than its counterparts). It also has a spare high slot for a nos, making an active repper a viable option. Finally, the infamous gallente structure hp allows the taranis to sport a reasonable buffer tank with only a damage control. While most taranises fit blasters, rail ranises can also be very effective thanks to their impressive range dictation, and still have a damage output comparable to the other close-range combat inties. Fighting a taranis can either be very easy or very difficult. If the taranis is mwd or dual-prop fit and you're able to dictate range, you can simply hold it at outside 6km and receive very little damage except for the drones (which you can kill if you like). A lot of people seem to go soloing in dual prop ranises, and due to their desire to get into scram range these make perfect targets for a t1 frigate with a bit of range control. An afterburner ranis on the other hand is one of the harder frigates to fight solo - it can dictate range against almost anything and while it lacks the pure staying power of assault frigates, it makes up for it with versatility. Do what you can to pull range (its damage output with antimatter will drop off quickly outside a few km) - this also has the advantage of reducing angular velocity, which at the taranis' optimal range can be a big problem for many ships. Neuts can be useful, especially if the taranis is active tanked, however since they often fit a nos it may have little effect. It's worth noting that taranises using neutron blasters (which while less common than ions are still seen fairly frequently) typically don't have room for a nos, and often field less of a tank too. Needless to say, if you're flying a support ship in a gang getting tackled by a hostile taranis is a bad idea, both because of their damage output and their ability to web you. Thankfully their lower speed makes them slightly easier to avoid than the other combat inties, although a mwd ranis is still fairly fast for a frigate. As with the gallente AFs, explosive is generally the best damage type to use against this ship. The crow is unusual among the combat inties in that while the others seem to be built to brawl, the crow is generally more comfortable at range. Like the taranis it sports a balanced 4/3/3 slot layout (with 3 launchers) and a double damage bonus. However as I mentioned earlier the crow is very fragile, and rockets lack the sheer dps output of blasters. The crow makes up for this with a missile range bonus and a significantly longer targeting range than the other inties, allowing it to make good use of that bonus. The crow can actually field a decent armour tank (think rifter with rocket launchers) however I don't think I've ever seen one used in this way. In practice, crows tend to field either a medium shield extender or (quite often on standard missile fits) no tank at all other than a damage control - and sometimes not even that! Untanked crows (like all other untanked inties) will die very quickly if caught, however without an armour tank the crow is a fast ship and can be very difficult to catch - meanwhile with standard missiles it can apply its dps onto you just fine. MSE crows on the other hand are actually one of the tougher inty fits in terms of hp, and lose no speed (other than potentially a low for a MAPC) in order to be so. As with the other missile frigs, the weakness of the crow is its poor dps. However, the ability to apply this consistently out to about 15km with rockets or 60km with standards shouldn't be underestimated. When fighting a crow, your priority should be getting it tackled close so you can apply your full dps. As with other missile ships, maximising your speed (with an ab) will help reduce its damage, especially if the crow is shield tanked and unable to fit a web. When fighting a kiting crow with standards, use manual piloting and warping around to try and bring the fight into scram range - failing all else, you can use the crow's own high speed to slingshot them out of their own tackle range (which is significantly shorter than their missile range, especially since they lack the tackle range bonus of fleet inties) and simply warp off. As with other caldari frigates, EM is usually best ammo choice to use vs the crow (one anti-EM rig is common, in which case EM and thermal are equally effective). Fleet or tackle interceptors are the second class of interceptor (comprising the stiletto, malediction, ares and raptor). As the name suggests, these ships are built to be the ultimate tacklers - while they lack the dps output of the combat interceptors they offer better targeting range, more mid slots, and most importantly a bonus to the range of warp disruptors - this allows a pilot with inty lv 5 to tackle out to 30km before overheating. Aside from just being generally very useful, this has the added utility of allowing these ships to tackle a battleship-sized target outside of heavy neut range. In one-on-one combat, most fleet interceptors are easy prey if caught, and a fairly minor threat if not - while they can be fit for close range brawling, they are generally less effective in this role than a t1 frigate (with the malediction being the notable exception). In gang these ships are a significantly greater threat, where they will lock quickly and hold their target effectively, usually at a range where that target can't effectively fight back. Expect most fleet interceptors to have a gang not far behind them, and if you see one sitting on a gate there's a fairly good change that the far side is camped. These ships are almost always fit with a mwd and a warp disruptor (aka a long point), and are typically lightly tanked. While I wouldn't recommend it from experience, is isn't uncommon to see these ships completely un-tanked. While there is generally less variation between the tackle interceptors than their combat counterparts, the stiletto is probably the most popular. While it is one of the slower interceptors, the stiletto has a major advantage in its slot layout - 3/4/3, perfect for a tackler. Like the claw the stiletto is naturally quite fragile, however of all the fleet interceptors this is the one you're most likely to encounter fitting a significant tank. A mwd and warp disruptor are just about manditory on a fleet interceptor, and due to naturally short locking ranges they usually need to fit a sensor booster or sig amp too (or an eqjuivalent rig). Because of the stiletto's 4th mid slot, it can easily fit a medium shield extender along with all the other necessary modules. It is also not uncommon for stilettos to fit some kind of electronic warfare (usually a tracking disruptor) in one of their mids, which can present a problem for turret ships when caught by one of them. Despite a damage and tracking bonus, the stiletto's damage output is poor and usually an afterthought to its tackling ability - in direct damage terms this ship presents little threat. If a stiletto engages you, the chances are it has a gang on its way to back it up! The malediction is unique among the tackle inties in that it receives a tanking bonus (in the form of 5% to armour resists per level). Like the vengeance it is a missile ship, with a bonus specifically to rockets - odd given that tackle interceptors rarely fight inside rocket range other than when fighting drones. The malediction's 4/3/3 lot layout makes it slightly less effective than the stiletto or ares as a pure tackler, however with 3 launcher hardpoints it can actually put out fairly reasonable damage for a fleet inty. This makes the malediction quite popular as a pseudo-combat inty, making use of its three mids and armour bonus to provide a more versatile alternative to the crusader (albeight with significantly lower dps). Like the taranis, this may take the form of dual propulsion or prop/scram/web (with either an ab or an mwd). With the highest natural top speed of the four fleet inties, the malediction is incredibly effective when it comes to range dictation, and is one of the few ships that can dictate range against a similarly fit taranis. Despite the bonuses however, the tank and damage output of the malediction remain fairly low compared to more combat-oriented ships. Providing you're actually able to apply damage effectively, the malediction isn't too great a threat. If your tracking is poor or your range is short on the other hand, expect it to be quite a challenging fight. Thanks to its resist bonus combined with a minor racial boost to exp/kin, the malediction has fairly strong resists across the board, with EM slightly higher than the rest. Its low powergrid makes buffer tanks difficult, so an active tank is the more common choice on this ship. 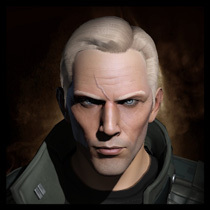 Neuts can be useful against it, however like all amarr ships the malediction's cap is naturally quite strong. Outside of this role, the malediction is one of the poorer fleet inties. Its locking range is naturally short, requiring some kind of enhancement just to lock out to its maximum tackle range, and it has one fewer slot to use for speed or tackle. Its armour bonus still provides it with a slight increase in hitpoints, however due to the kind of fit required for long ranged tackling it should still present little threat to anything able to catch it. One point worth mentioning is that if fitting standard launchers, the malediction is the only inty which can effectively apply damage from tackle range, although not very much of it. The ares is another strong tackler, with speed close to the malediction and and a 3/3/4 slot layout allowing it to further enhance its speed, or use a lot slot for a signal amp. Additionally, the gallente's strong structure hp gives the ares a reasonable buffer when using the standard fleet interceptor tank of a single damage control, although this is slightly lowered if the pilot is fitting nanos (which is quite common). While the ares is a great tackler, it generally presents fewer surprises than its rival the stiletto - a medium extender fit is slowly catching on (but still quite rare at this point), and with 3 mids any additional ewar is unlikely. Some newer pilots will fit a web in the third mid, but without an AB or scram this shouldn't present a problem - if you can catch it, it should die fairly easily. As with the stiletto, when fighting an ares you should concern yourself more with the gang likely to be hot in pursuit! The raptor is generally considered to be the worst of the fleet inties, and has earned a rather inventive nickname as a result (can you guess what it might be?). This is the slowest of the four fleet inties, and like the malediction it receives a 4/3/3 slot layout (with 3 turrets). Unlike the malediction, it doesn't receive a tanking bonus and is fairly poorly suited to close range combat. It's possible to fit a blaster raptor capable of wielding a surprisingly high dps output, however any real tank remains elusive due to very weak powergrid. A kiting rail raptor is potentially possible thanks to its optimal range bonus, but I've yet to see one put to use. In summary, the raptor is both the easiest inty to catch and the easiest to kill. Outside of inventive fits, it should be a fairly easy fight assuming you can actually land tackle. A very interesting ship class, stealth bombers are not only capable of moving and warping while cloaked, but they also wield battleship-sized weapons (torp launchers to be specific). This gives bombers the highest damage output of any frigate by a considerable margin (up to about 500dps) usually out to around 50-60km, or potentially more 100km with range rigs and javelin torps. Additionally, the stealth bomber is the only cloaky class which can begin locking a target immediately after decloaking (all other ship classes have a short targeting delay). The downside to the bomber's obscene dps is that its weapon system can barely scratch other frigates. In fact, even battleships need to be target painted (and ideally webbed) for the bomber to hit for its full damage. This makes bombers incredibly effective when supported by rapiers (minmatar cloaky recon ships with web and painting bonuses) and arazus (gallente cloaky recon with a huge bonus to tackle range), but of limited use solo. That said, a well fit stealth bomber can successfully solo large targets like ratting battleships if they're able to evade damage themselves. These ships are also capable of lighting covert cynosaural fields, potentially allowing a black ops battleship to bridge additional cloakies to the stealth bomber's location. Stealth bombers are very popular in lowsec, where they're used for Factional Warfare missions. If you're able to catch one in another frigate, expect an easy fight - bombers are rarely tanked, and will deal almost no damage to you in return. If you're engaged by one while flying a larger ship it may be cause for concern, however you may simply be able to drive it away with drones (providing you can weather its dps for long enough to do so). An additional feature of the stealth bomber is its ability to launch bombs - an area of effect weapon which can be very effective when used in a coordinated group (although these can only be used in nullsec). Bomb damage is determined by the sig radius of the target up to a maximum of 8000, so with the exception of frigates and destroyers which happen to be running mwds at the moment the bomb hits, nothing will die to a single bomb (although it doesn't stop the bomber pilots trying). Coordinated bomb strikes of 5 or more bombers can be devastating if done correctly - if you're in a gang in 0.0 and know you have a large number of bombers in system with you, expect them to be setting up for one of these. I won't go over each bomber individually since they are all really quite similar. All bombers receive large damage bonuses to their racial damage flavour, and will almost always use that variety of bombs/torps as a result. The hound is the fastest (which is useful for moving while cloaked) and as a result tends to be the most popular, and its 4/3/3 slot layout (also shared by the purifier) allows it to enhance its damage output and/or speed further. The manticore and nemesis have 4/4/2 slot layouts which favour additional ewar, and these two ships seem to be more popular for FW missions. All bomber fits tend to be fairly similar, with target painters and sometimes sensor dampeners being popular mid slot items. Tank usually consists of a medium shield extender, if anything at all. Like stealth bombers, covert ops ships are capable of warping while cloaked and lighting covert cyno fields. They don't put out anything like the damage of stealth bombers, and although they do still receive damage bonuses they are almost always used as scouts and probers - a role in which they excel. If you see a covert ops ship in system, expect them to be scouting for a gang. You should also watch closely for scanner probes via your directional scanner, since these can potentially let the covert ops ship warp themselves (or more dangerously, their fleet) to your location within seconds. For the most part, covert ops ships are not actually dangerous in combat themselves, although they provide enormous utility to a gang. Due to their speed and cloaky nature these ships are notoriously hard to catch, and they rarely decloak other than to go through gates and drop probes. If you are able to catch and decloak one, they will generally die very quickly indeed. Bizarrely, the helios is actually a very effective combat frigate - both due to its strong damage output and an unparalleled ability to control fights. The combat helios is a concept with (as far as I'm aware) was originally popularised by Morel Nova of Genos Occidere, although Reiisan of Agony also deserves a mention on account of his incredible success with them. The first thing to note about the helios is its slot layout - 2/5/3 with 2 bonused turret slots and 1 bonused drone. With 5 mid slots, the helios is able to dictate range against almost any target via the combination of afterburner,scram, and 1 or 2 webs, and still have a mid slot or two free for ewar (tracking disruptors being the obvious choice) to further skew the odds. Additionally, with 2 hybrid turrets and 1 drone, a blaster helios is able to out-damage most t1 frigates and some t2. With rails, its still able to put out respectable dps but has the option of kiting too. Finally, the legendary gallente structure hp allows the helios to get away with a 1 slot tank via a damage control, leaving the rest of its low slots free for a damage mod and a MAPC (which is required in order to fit any weapons in the first place)! The result is a very tempting target (after all, who expects a covert ops to be a serious opponent?) which is capable of shutting down and tearing apart most other frigates. With blasters, the helios is able to put out excellent dps and with one or two tracking speed scripted tracking disruptors, few ships are able to hit it once it gets in close. Rail fits are equally effective, holding their targets at range and using optimal range scripts to reduce even the range of scorch and barrage to point blank. With only 2 high slots, the helios is unable to fit both turrets and its normal cloak - this leaves combat helioses fairly useless in an actual scouting role. It also gives them a slight handicap in finding fights, although no more so than any other non-cloaky ship. If you encounter a helios sitting mysteriously uncloaked, my advice is to steer clear or engage from comfortably outside web range until you can verify the fit. Use the look at function to check for guns - a regular helios (with cloak and a probe launcher) will have no turrets. In terms of the fight itself, use a missile or drone ship if you have the choice. If you're in a turret ship, expect a difficult fight if the helios turns out to be combat fit. The buzzard also deserves a mention on the same basis. Like the helios the buzzard has 5 mid slots, although its slot layout is 3/5/2 compared to the helios' 2/5/3. In terms of combat ability, the buzzard is less effective - its dps with rockets is low, and with fewer low slots and less structure it struggles to tank effectively. However, where the buzzard has an advantage is that it can fit a cloak while still maintaining a viable combat fit. In addition, missiles have no visible markers on the hull. This means two things - firstly, a combat buzzard can still function as a cloaky scout (albeight without probes), and can use its cloak to hunt targets stealthily. Secondly there is no definitive way of telling the difference between a combat buzzard and a regular one without fighting it, and if you expect the buzzard pilot to show his hand before he has you comfortably scrammed and double webbed, think again. Electronic attack frigates (or EAFs) are essentially the frigate-sized brothers of recon ships - they generally receive the same bonuses as the related recons, but at a reduced strength. 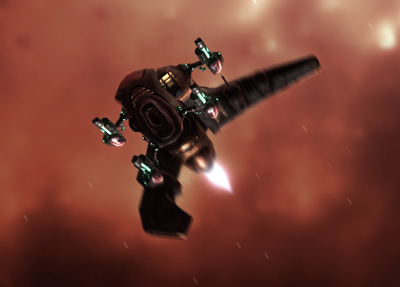 However, while recon ships are incredibly popular, EAFs are probably the least-used ship class in Eve. The main reason for this is that they're simply very fragile. EAFs don't have the tank of assault frigates or the speed (or more importantly the mwd sig-radius bonus) of interceptors, giving them no real method of staying alive. While their primary ewar is generally more powerful than on the t1 version and they have more mid slots, EAFs have short locking ranges and their secondary ewar types are all much shorter ranged, both of which bring them closer to hostile fire. That said, EAFs do have some very interesting features and can be quite effective - whether that effectiveness is enough to justify the price tag is for you to decide, but most of eve seems to think not. Like its t1 counterpart the vigil, the hyena receives a rarely used bonus to target painting. However like the minmatar recons it also receives a bonus to web range, which comes in much more useful. Where the rapier or huginn can web out to 40km however, the hyena's smaller bonus only pushes a regular web to 20km with EAF lv 5. Still, that ties in nicely with maximum point range and is by no means useless. The main problem however is that at 20km, the hyena is very vulnerable - many cruisers and above can hit out to this range comfortably, and if the opposing force includes any frigates it's only a very short distance they need to travel before they're on top of the hyena itself. The hyena is also slower than the vigil, and is a rare ship in that it receives no weapon bonuses whatsoever - instead receiving a cap bonus and a signature radius bonus (it's worth noting however that the hyena's base signature radius is already considerably higher than an inty or AF. This makes it little use as a solo ship, where under other circumstances a kiting hyena might potentially have been quite effective. In terms of a tank, the hyena's 3/4/3 slot layout lets it fit a medium shield extender and a damage control while still having the slots it needs for ewar, propulsion, and speed mods. However, the hyena's base hp is very low, and even with an mse it's a fragile ship. The biggest threat when fighting a hyena is simply being held at range until it can bring friends to kill you, however if you can get one scrammed they will typically pose little threat and die quite quickly. In a gang, hyenas (like all EAFs) are easy targets and should be primaried early - this is especially easy with the hyena since it has to be in quite close to make use of its webbing bonus. The sentinel is unique among the EAFs in that it is actually a popular solo vessel. Like the curse, it receives bonuses to tracking disruptors and to both the range and drain amount of neuts/nos. Again like the curse, this is backed up by a sizeble drone bay - with bandwidth for 4 light drones at a time and enough drone bay space for 12 (that's right, even more than the ishkur)! With a 3/4/3 slot layout, most sentinels will field a small (usually active) armour tank leaving their mids available for ewar (although as with all frigates, you'll find the occasional pilot flying one completely untanked and loaded up on speed mods instead). Small neuts and nos on a sentinel will hit out to around 18km with EAF lv 5, and each one will drain more than a regular medium neut - as a result the sentinel is capable of sucking another frigate's cap completely dry in 2 or 3 cycles, leaving any opponent with cap-intensive weapons or an active tank all but helpless. Since the damage output of the sentinel relies entirely on its drones, it's fairly poor for a t2 frigate. However, compared to other EAFs and considering that the sentinel is able to all but disable its opponent this is not to be underestimated. The fact that the damage is drone-based also means the sentinel can engage effectively from any range, and with a large drone bay there's little danger of running out of them. When fighting a sentinel, your cap is a luxury that you will need to do without as much as possible - drones or capless weapons will help significantly, as will a cap booster or nos to keep your tackle running. Expect the sentinel to field at least one tracking disruptor too. Your best bet is to get in close and overload from the beginning, dealing as much damage as possible before the sentinel's neuts begin to cause a problem. The sentinel has plenty of spare drones and relatively little hp, so if you're able to shoot the ship itself this is usually a better idea than shooting the drones. If your cap runs dry and you lose tackle before you're able to take the sentinel down, expect it to pull range quickly - if it manages to do so, then there's little you can do other than shoot the drones and hope to force a stalemate. If you have a nos or booster and are able to keep your tackle active, superior dps and tank should be able to turn the fight in your favour. The keres receives both the damp bonus of the maulus and the warp disruptor range bonus of the gallente recons. In addition to this it receives a somewhat useless bonus to dampener cap use and a considerably more useful bonus to warp disruptor cap use (which can be a problem on frigates, due to the high cap consumption of long points). Thanks to the high gallente structure hp that I seem to be mentioning a lot, the keres is reasonably resiliant with just a damage control, and with a 2/5/3 slot layout it can potentially augment that with a shield extender while still having plenty of mid slots left over, although fitting is quite tight. The disadvantage of the keres as a damping platform is that it has significantly lower targeting range than the maulus, at a mere 48km. This makes the keres fairly ineffective for range dampening without a sensor booster or similar mod, which in turn means sacrificing slots just to do what the maulus can do out of the box. The additional mid slots of course mean that even with a sensor booster it can still field more damps than the maulus, so not all is lost. As a long ranged tackler, the keres has some promise - able to tackle out to 36 km with a t2 warp disruptor. However this isn't all that much further then a fleet inty, and in return the keres gets lower speed and a much higher signature radius thanks to both its base sig and its lack of the interceptor's mwd bonus. However, those 6km may sometimes make the difference, and having 5 mids compared to the 3 of the ares is a potential game changer. As with the hyena, the lack of a damage bonus makes the keres fairly poor as a solo ship, and if you can catch one solo it should present little threat. In fact unlike the other EAFs, the keres is the only one whose ewar doesn't really provide it any protection should it get tackled. In gang they are more of a worry, but as with the other EAFs the keres is a fairly soft target. Whether you would consider primarying it early really depends on how vulnerable your gang is to damps - if the answer is not very, the keres doesn't really pose a significant problem outside that of a regular tackler. Unlike the other EAFs (and in line with caldari recons), the kitsune doesn't receive bonuses to a secondary form of ewar and instead gets even more ecm bonuses. In other words, it's like a griffin but better - its jam strength is stronger, and with a 4/5/2 slot layout it has one more mid for ecm. It even receives a bonus to ecm optimal range, however that it offset by its main flaw - the kitsune's targeting range is tiny for an ewar ship, at 52km compared to the griffin's 75km. This effectively mandates fitting at least one range-enhancing mod (usually a sensor booster) which means immediately losing the 5th mid slot. When short-ranged very reliable jams are order of the day, the kitsune is perfect for the job. However as mentioned previously, it is very vulnerable at this range. Seeing a kitsune solo is rare, and may actually be a challenge since unless you have drones the chances are it will simply jam you permanently. This could potentially make a solo kitsune (like the solo griffin) very effective, although I've never seen one. Generally kitsunes are set up for gang work and fit no tackle, so if you do engage one solo they're likely to simply jam you and warp off. In gang, these are soft targets and should be early primaries if you can catch them. If you're able to remain unjammed and apply damage effectively, kitsunes will die just as easily as griffins. I love these posts great work. This is a great series--thanks Azual! It should also be noted that Black Ops also have no targeting delay after decloaking. I actually thought that it was intended - Azual said that SBs are the only cloakies that have no targeting delay, and Black Ops aren't exactly cloakies (can't fit CovOp cloaking device). You know, I actually didn't realise that. And I'm even one of the five people in Eve who fly one! Any fitting advice for it or do I have to wait the for "Know Your Enemy - T2 Battleships"? Most of the time you don't actually bring the blackops into the fight - you just use it to bridge other ships. If you do want to jump the blackops in too, you'll want to fit it for maximum gank and survivability. Your priority is to kill whatever you've hotdropped as quickly as possible, then get out before backup can arrive. "Fighting a taranis can either be very easy or very difficult. If the taranis is mwd or dual-prop fit and you're able to dictate range, you can simply hold it at outside 6km and receive very little damage except for the drones (which you can kill if you like). A lot of people seem to go soloing in dual prop ranises, and due to their desire to get into scram range these make perfect targets for a t1 frigate with a bit of range control. An afterburner ranis on the other hand is one of the harder frigates to fight solo "
It seems a little counterintuitive, that a afterburner taranis is easier to fight than one that has both an afterburner and mwd.